Who Needs Nails When You Can Meld Wood In A Vortex Of Thread? Most furniture has the business parts of its joints buried deep inside it somewhere. Screws hidden in hollow metal frames, screws driven deep into wood. 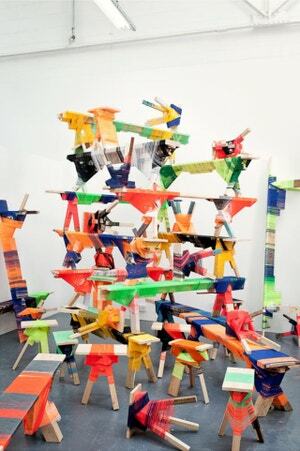 The furniture made by Anton Alvarez wears its colourful thread joints on the outside. And the machine used to tie it all up is a beast. Alvarez makes his pieces using the boringly named "Thread Wrapping Machine" but the name lacks in flair, the machine makes up in insanity. Seriously, this sucker looks like it should be spinning black holes or something. All it takes is two pairs of willing hands to hold precisely positioned pieces of lumber in the contraption's gaping maw, and a bout of wild spinning does the rest, welding the limbs together with a blistering storm of thread. It's some seriously crazy robot knitting.